Do you know a lively, young band which conjures on the dance floor an absolutely harmonious and intoxicating mixture of rock, jazz and blues ideally combined with Latin, ballads and the greatest hits of the 60's, 70's & 80's? A-Live has been calling attention to itself for several years now - the six musicians on the stage in up-beat outfits guarantee a fresh sound coupled with enormous musicality. Of course, the good old, immortal waltz is also a set musical element of A-Live's repertoire. 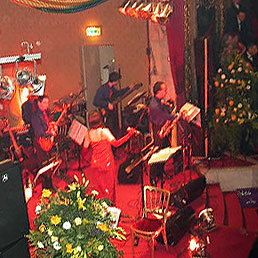 In the past few years, the band has developed, an ever-growing following - among their regular engagements is the "Vienna Regenbogen Ball" where the band has been the musical mood-setter since 2001. Other big events with A-Live were the opening of Euro-Pride 2001 as well as the Gala of Lacroix 2000. The enthusiastic feedback of the audience has strengthened the band in its professional intention to make music with heart, soul and understanding - whether at galas, balls or private parties, the six musicians deem their collective concern to be the fulfillment, in a very special way, of the musical wishes and expectations of the audience.